The High Frequency/ Violet Ray - Now Available in 110V and 220V versions! Make it a part of your lifestyle as a means for achieving a beautiful complexion and a full head of hair. 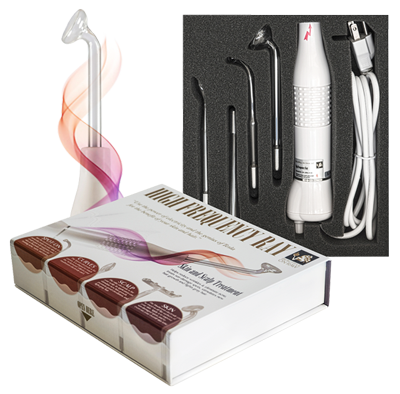 The High Frequency Ray is a holistic device that will complement your healthy lifestyle and will provide invaluable assistance in revealing your own Rawsome Beauty. The Violet Ray was originally developed by the famous scientist Nikola Tesla. Tesla was successfully experimenting on disease and rejuvenation with ozone in the late 1800s and early 1900s. In the 1920s and 30s, Oxygen/Ozone Therapy was used in hospitals, sanitariums and clinics. Beginning in the second half of the 20th century, pharmaceutical companies started disparaging all electro-therapies as drug-oriented medicine was taking off. Consequently, electro-therapies became unpopular in the United States. 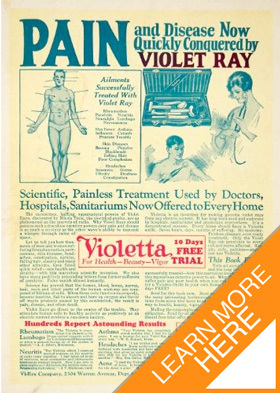 Physicians used to prescribed the violet ray for numerous diseases. As you can see from this 1930's violet ray manual some of the claims were far-fetched. However, in the 1950's when pharmaceutical companies came to the forefront, the pendulum swung to the other extreme and doctors began denouncing the violet ray as quack medicine, not giving any credence to the device. The term Violet Ray, strictly speaking is reserved for the specific device Nikola Tesla invented a century ago. Now similar technology is available to us to reduce the appearance of wrinkles, moles and other skin blemishes and to stimulate hair growth. It's officially called the High Frequency Ray. However, it's often referred to it as the Violet Ray. Same principle. Same use. But the modern High Frequency Ray machines are concidered safer. They’re properly grounded, electrically, which Tesla’s weren’t. And they’re UL-listed, which means the folks at Underwriters Laboratories have examined the device’s structure and manufacture, and pronounced these safe. The High Frequency Ray (The Violet Ray) uses an inert gas (either Argon or Neon) inside the electrodes. Argon glows a violet/blue color, which is why the inventor Nikola Tesla originally named the device- the Violet Ray. However, neon works exactly the same way, yet it glows an orange/red color. Your unit will arrive with either violet or orange glowing electrodes. The gas is there only to notify you that the unit is working properly and the choice of gas has no bearing on the effectiveness of the unit. This hand-held unit comes with four glass electrodes - the Mushroom, the Rake, the Curved and the Spoon. The Mushroom and the Spoon electrodes are used to apply anywhere on the skin surface. 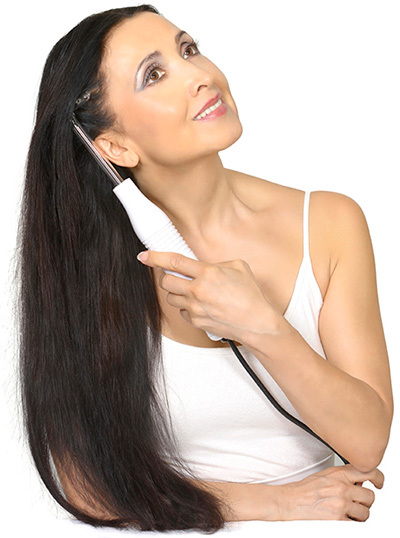 The Rake is used on the scalp for hair growth, promoting circulation, and halting hair loss. The Curved electrode is used for zapping acne, warts, moles, and blackheads. The High Frequency Ray is a high-voltage, low-current source of high frequency waves. High-voltage is what makes the device work. Low current (low amperage) is what makes it safe. Light, heat, electric energy and ozone are produced in each glass vacuum applicator. Through this high frequency process, the Ray oxygenates and stimulates the skin and scalp. When an electrode is applied to aging, diseased or infected areas, these forces promote healing. Hello Tonya, I have something amazing to share with you! When I purchased your special ray device...it was with a lot of anticipation...You see, I was losing my hair! I always lose a lot of hair each winter and then it grows back just fine, but this was DIFFERENT. My part became very enlarged! My scalp was showing in this ever widening part. Each day it was getting dramatically worse. I wasn't sure why this was happening, but I was quite concerned. Hence the purchase of your machine. I also purchased your hair serum, and have been using them both together. Truly, the results have been MAGICAL. It's been only a few weeks, but honestly, my problem has been almost reversed! I would never have believed it could happen that FAST. I am SO relieved I cannot even express it in words. The High Frequency Ray is totally safe to use. In nature the sun turns oxygen into ozone. In the Violet Ray, this is done though a high-frequency (10,000-hertz), high voltage, low-current electrical source. You'll find that the current produces an agreeable tingling on your skin’s surface as it increases oxygenation in the form of Ozone (O3) in the blood. O3 ozone is so reactive, chemically, that it constantly wants to become stable O2 oxygen by giving up O1. This reactive form of oxygen is known to chemists as "singlet oxygen." These singlet oxygen molecules are created in a gush of O1 releases. These O1s are negatively charged. They are hungry to catch something positively charged. Toxins and pathological bacteria are all positively charged. Because of the active oxygen's negative charge, it combines with the filth in the body, oxidizing it, then to be flushed out in the bloodstream. Learn much more about Electrotherapy in this free e-book (no registration required)- Electrotherapy and The Violet Ray. Specific discussion of the benefits of the Violet Ray starts on page 200. All the wastes your body excretes - whether through urination, bowel movements, sweating, spitting, skin particles that are sloughed off your body's outer surface - are composed mainly of four basic elements - hydrogen, carbon, nitrogen and sulfur. If combined with oxygen, natural oxydation processes will turn these into H2O, CO2, NO2 and SO2. These are, respectively, just the chemical names for water, gaseous carbon dioxide, the toxic gas nitrogen dioxide, and the acidic gas sulphur dioxide. In this way additional toxins leave the body. It's believed that applying the Violet Ray stimulates this vital “detoxification” process. My dear Tonya, I received my Violet Ray and have been so pleased with the immediate results. As always, many thanks to you for your resourcefulness. The fundamental difference between diseased and normal cells is this ... Healthy cells have an army of protective enzymes to protect themselves from oxygen by forming a self-protective antioxidant coating. Strict anaerobes, just as diseased cells, lack these protective enzymes and are killed by oxygen. Anaerobic microorganisms cannot live in the presence of active forms of oxygen. Viruses, fungus and other human pathogens are drawn out to bind with reactive oxygen. They will be "burnt" - neutralized by oxygen. Oxygen is your most aggressive free radical scavenger. The High Frequency/ Violet Ray actually charges your body's battery by causing cells to open up more than usual, allowing them to flush out toxins more easily. Nutrients then return to the cells and the detoxification routine increases lymph flow. By opening up the blood cells and encouraging their natural ability to regenerate, new tissue replaces damaged, diseased cells, flushing them out of the system with other toxins. This “cellular massage” instead of muscles, expands individual cells. The stimulation at the cellular level by high-frequency current is why the Violet Ray treatment generates such marked improvements. This device intensifies fresh blood circulation. The extra flow of blood equalizes the circulation in crowded areas, helping heal bruised and damaged tissue. The ray improves circulation in congested parts, restoring bruised, inflamed and diseased tissues to normal. It's great for reducing wrinkles, warts and moles, and for promoting new hair growth. oxygenates, restores and reduces the appearance of wrinkles, discoloration, and other skin blemishes. The High Frequency/Violet Ray plugs into an ordinary household electrical outlet. The healing rays are dispersed through glass applicators, called electrodes, in the violet colored stream - hence the name Violet Ray. (Not “ultraviolet” or UV rays, mind you - a different part of the spectrum, outside the visible range.) The substantial voltage is applied to the point of contact with a tiny shock. A pleasant warmth is all you'll feel. Use it on your hair and scalp if you seek fuller healthier hair growth. Just 5-10 minutes each time, once or twice a day, will give you all the benefit. Please always start at the lowest setting! Your Violet Ray will require no maintenance. Just remove the electrode when you've finished your short session, unplug your Violet Ray and - you're done! It needs some time to cool down after each 10-minute use. Your High Frequency/Violet Ray comes with a Three-Year Limited Warranty for parts and labor! For USA/Canada/Mexico and selected countries orders: 110V, 60Hz, 0.12 Amps with the North American standard plug-class I type B grounded plug. European and selected other countries orders: 220V, 50Hz, 0.06 Amps with a European standard plug-Europlug Type C.
If you order shipping to USA, Canada, Mexico, Guam, Virgin Islands, Panama, Trinidad and Tobago, Turks and Caicos Islands, Colombia, or Equador, we will ship the standard USA 110V version. If you order to any other country, we will ship the 220V version with a European Standard plug. If that is not the unit you wish to receive, please specify as such in the "customer notes" section at checkout! If you are in the U.K., Ireland or outside of Europe you may need to get a plug adapter to convert the Europlug to your country's plug. Such adapters should be readily available for only about 2 English Pounds, 3 USD or 3 AUD. If you're ordering from Japan, Jamaica, Cuba, Peru, Saudi Arabia, Madagascar, North Korea, or South Korea, please contact us for details of which version you should receive. Learn more about Nikola Tesla's Violet Ray: How Does it Work? You may purchase the Violet Ray from my natural beauty store. Disclaimer: The High Frequency/Violet Ray is not intended for use in the diagnosis of disease or other conditions or in the cure, mitigation, treatment or prevention of specific skin disorders or diseases. Combing or Brushing Your Hair… Which is Better? Hair Care Products: Aren’t We Supposed to Switch? blessed beyond measure by Tonya’s life work!! !